What's your ideal day? There are a lot of things I could name to be included in my ideal day (like ice cream! non-negotiable! ), but a few things stand out in my mind. Waking up without the alarm clock after 8 hours of sleep (even at the crack of dawn; it's still waking up without the alarm). Lacing up my running shoes and heading out for a run, ideally with Ryan. Returning, exhausted and hungry, and having the opportunity to stretch, foam roll, and then leisurely make breakfast (key word: leisurely), with no rush to shower, clean up, or head anywhere. I was lucky enough to have a few of these days this summer. One that stands out was while visiting my family over the 4th of July. We slept. We ran (HARD, thanks to humidity and hills...but we'll overlook that!). We ate. We relaxed. Then, Labor Day, I had a similar experience with Ryan. We slept it and then headed out for a little run together. The little run turned into a ten mile long run; the miles flew by as we enjoyed the first cool morning of the season and the fact that we were out running on a late Monday morning instead of sitting at work. 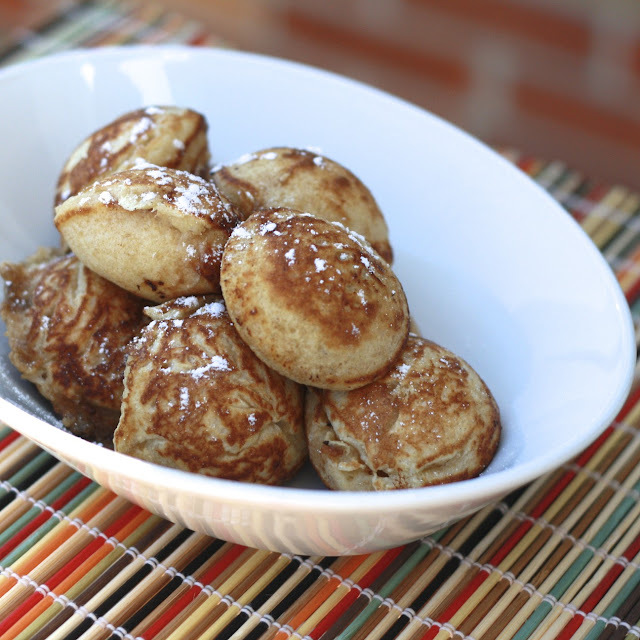 We returned, excited to relax the rest of the day, and decided to make breakfast together: Ebelskiver Pancakes, a new food to both of us. 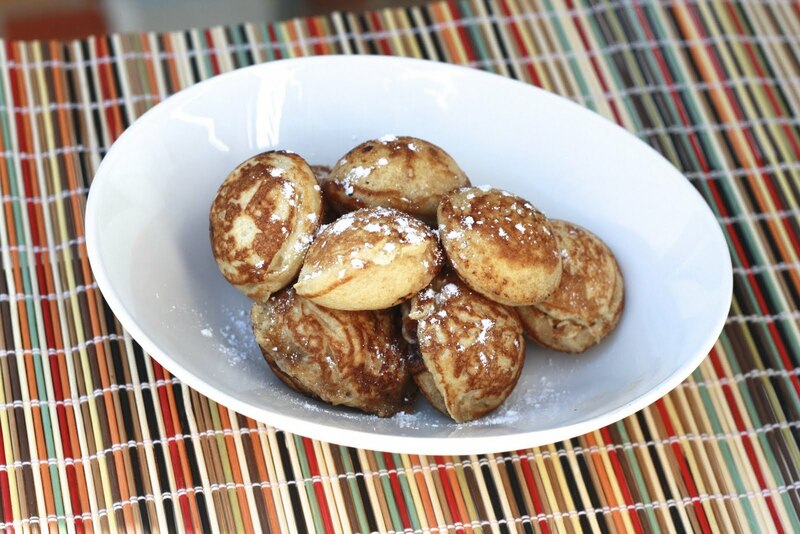 Ryan bought me an Ebelskiver pan for my birthday, knowing nothing about Ebelskivers but knowing his kitchen gadget loving wife would get a kick out of it! He was right! We loved this form of pancakes and tag-teamed the process: he'd fill with batter, I'd drop some jam in, and he'd top with more batter. These turned out perfectly browned and cooked through, and we found them sweet enough to need nothing more than a sprinkle of powdered sugar. Strawberry jam was our filling of choice, but we've been brainstorming other good fillings: mashed banana, berries, peanut butter, and NUTELLA! These are a fun breakfast-well worth the need of the extra pan-and I can see us making a dessert version of these sometime in the future too. 1. In a large bowl, whisk together flour, sugar, baking powder, and salt. 2. In a separate bowl, whisk together egg yolks. Stir in buttermilk, melted butter, and vanilla. Pour the wet mixture into the dry and stir until well-mixed. Batter may be lumpy. 3. In a clean bowl, beat egg whites with an electric mixer on high until stiff peaks form (not dry stiff peaks). With a spatula, fold about 1/3 of the whites into the batter. Fold the remaining whites into the batter until no white streaks remain. Use batter immediately. 4. Heat ebelskier pan over medium heat and spray each cavity with cooking spray or add butter to each and allow to melt in the heat. 5. Place 1 tbsp of batter in each cavity. Top with 1-2 tsp of jam and top jam with another 1 tbsp of batter. 6. 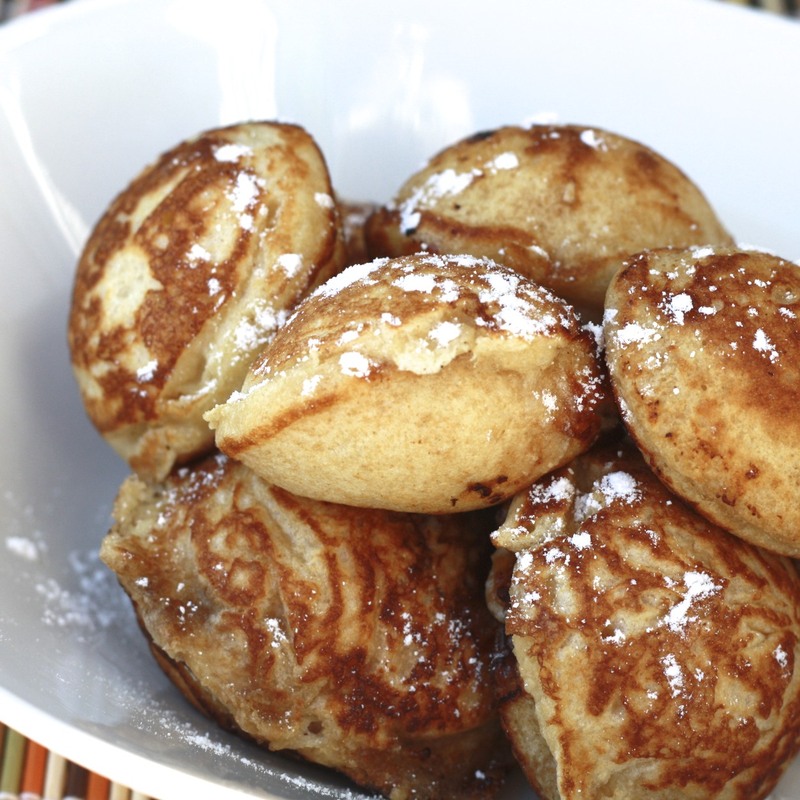 When the sides begin to bubble and start to dry, use wooden skewers or chopsticks to flip the ebelskivers over (not as difficult as it sounds). Continue to cook until golden brown. Remove from pan and transfer to a plate. Repeat with remaining batter. 7. 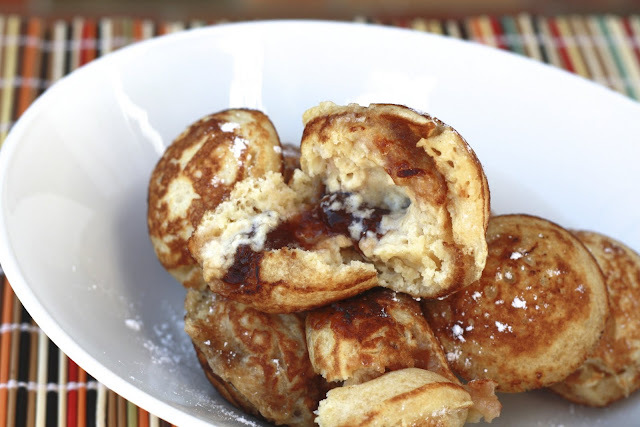 Serve warm with powdered sugar, honey, syrup, or desired toppings.